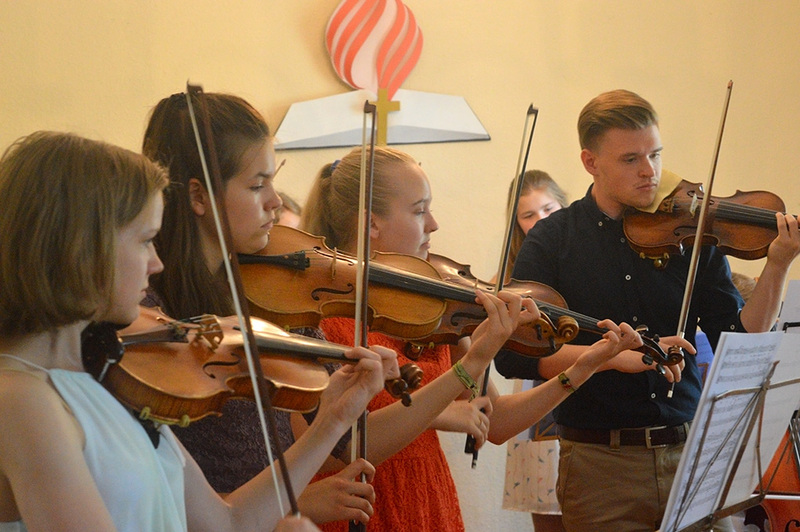 Adventist children and youth orchestra camp that was launched in Estonia as a result of the efforts by both Hans Soosaar and the music teacher Raeli Florea (who is also the conductor of the orchestra) celebrated already its fifth anniversary this year. 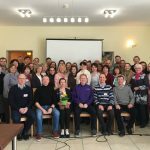 Unlike during previous years, the camp did not take place in Estonia, but in Valka, Latvia, and had more international participants. 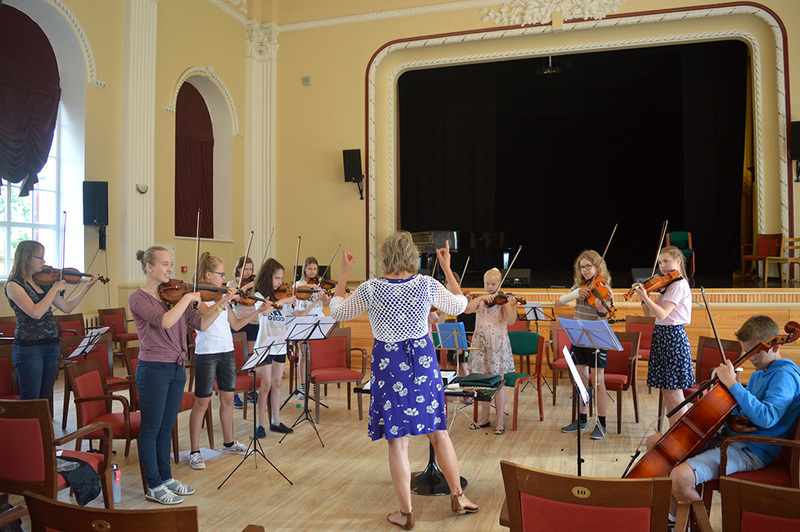 There were 34 instrumentalists aged 9-24 and in addition to the familiar Latvian children, this year’s camp welcomed young musicians from Lithuania as well. 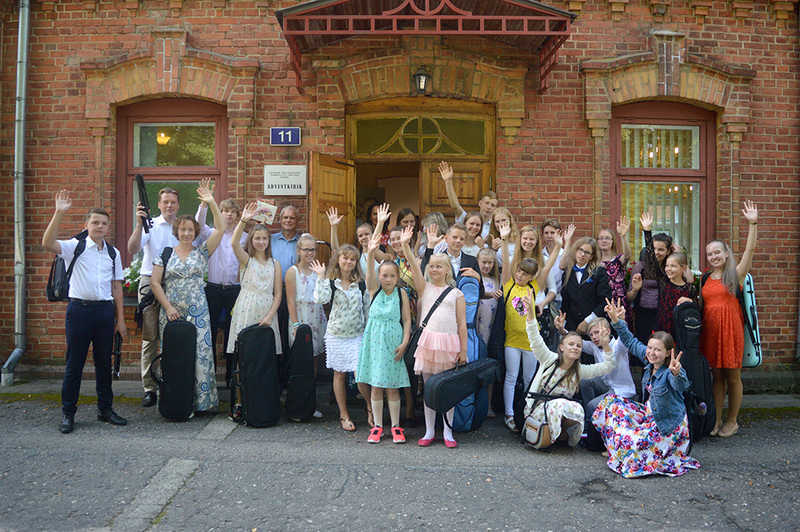 The participants slept in the rooms of Jānis Cimze school and the rehearsals took place at Valka Cultural Center. 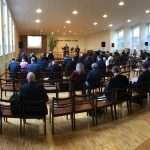 Since the participants came from all three Baltic countries, some of the funding came from the Baltic Union Conference. Many participants also agreed that the camp was well organized. 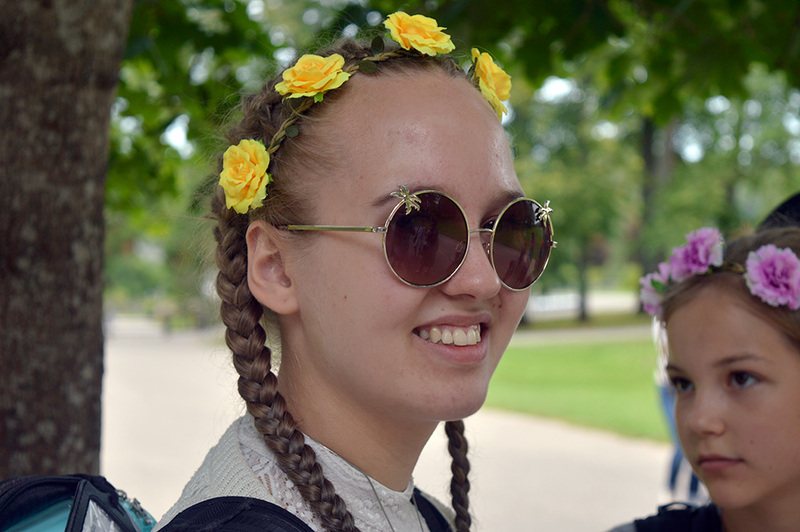 “It all worked,” said the conductor Raeli Florea as she remarked that she was very content with the camp, “there was something special organized for the children every evening. 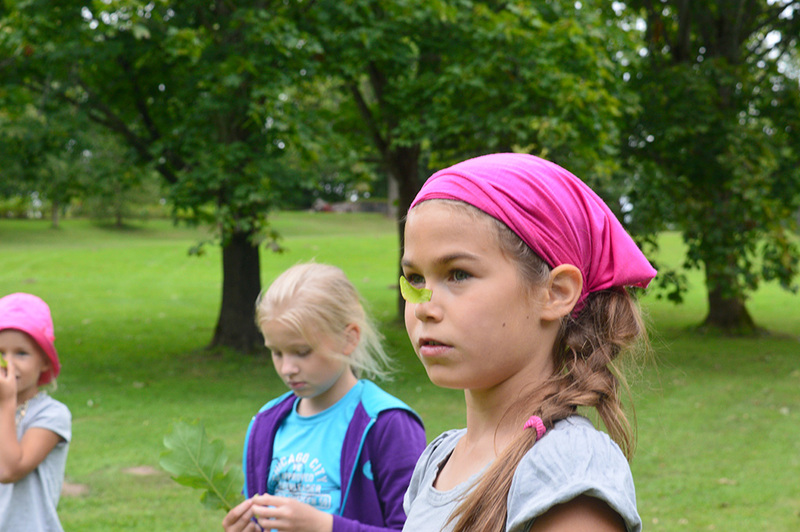 There are more forests and lakes in Latvia and all the children had a great time.” Both bigger and smaller participants liked the athletic games, as well as crafting, though everyone’s favorite was the collective swimming trip on Tuesday evening. 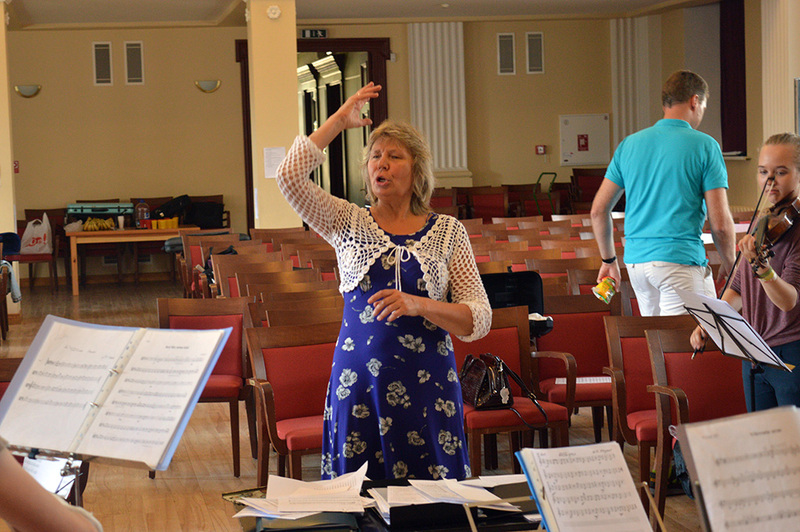 The conductor, Raeli, has noticed that during the five years, the quality of the orchestra and the skills of the participants have significantly increased and it is possible to add more complicated pieces to the repertoire. “It is possible to demand [more] from the children and the sound quality and intonation is becoming much easier and more natural. Due to this, the tone of the orchestra has improved.” In addition, the players are able to push themselves and work for a beautiful tone. “The camp is in the middle of the summer,” says Raeli “and it makes sense that all children do not practice during the summer. 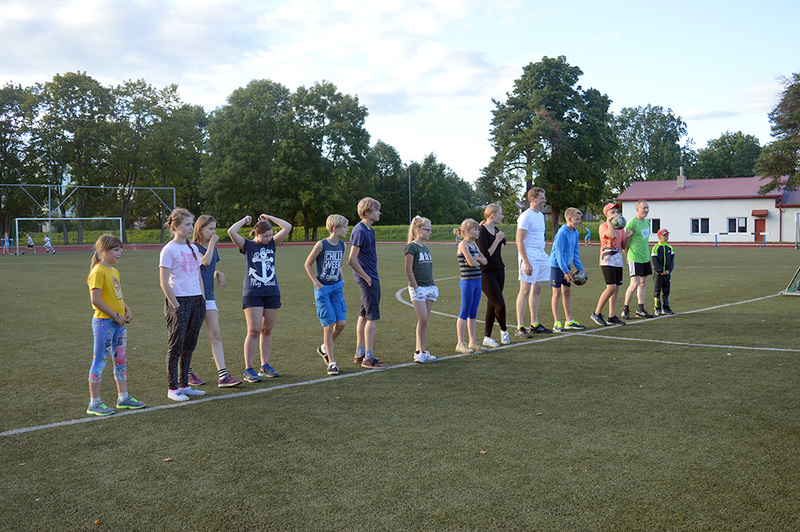 The first day was quite hard but it seemed that on Thursday evening, the four days of work had been fruitful. The children observe each other, they hear each other and enjoy making music. It is not just work, it’s already pleasant as well. A wonderful surprise was Karl Allikvee, who came to help us out with his high-quality tone and good musicianship. 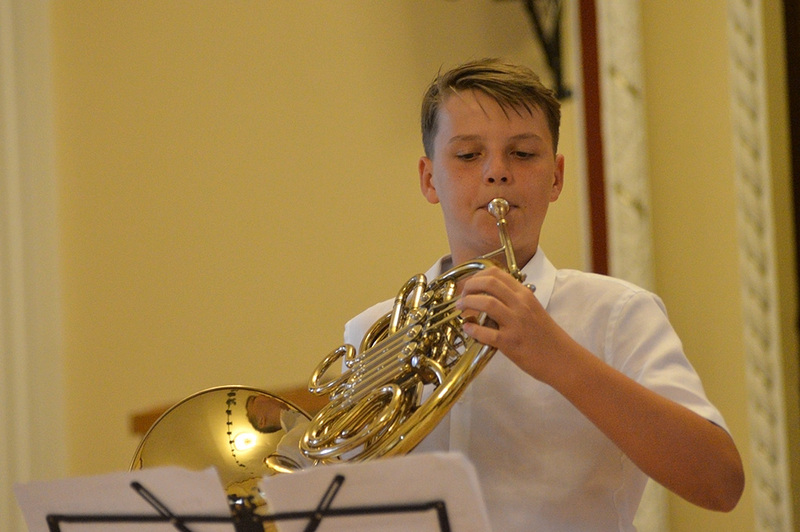 He was an example for others, small children who looked up to him, and he filled our orchestra with a very beautiful sound.” Pastor and composer Rein Kalmus has made the special arrangements for the orchestra, so that all the participants, small and bigger ones, can enjoy playing. The players enjoyed making music together so much that several of them mentioned that the best part about the camp were the rehearsals. “Then everyone is together,” explained Helina Sommer, who plays 1st violin in the orchestra. 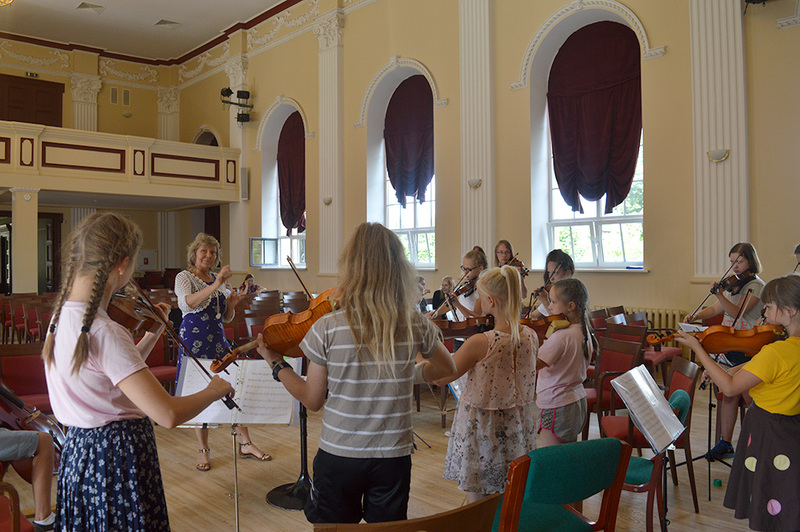 “It is possible to be together with friends and play your instrument,” said Camilla Kaaver, who is also among the 1st violin section, and mentioned that in addition to having fun, it is important to practice. 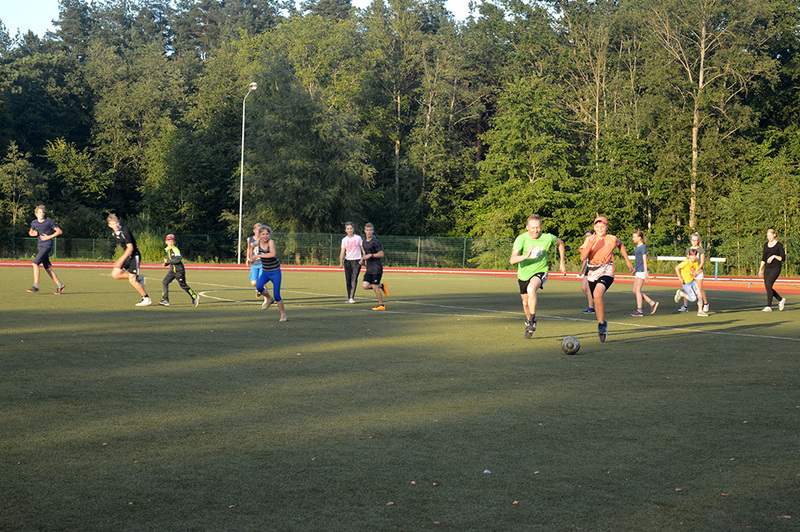 Many participants noticed that their skills and technique had improved during the camp. 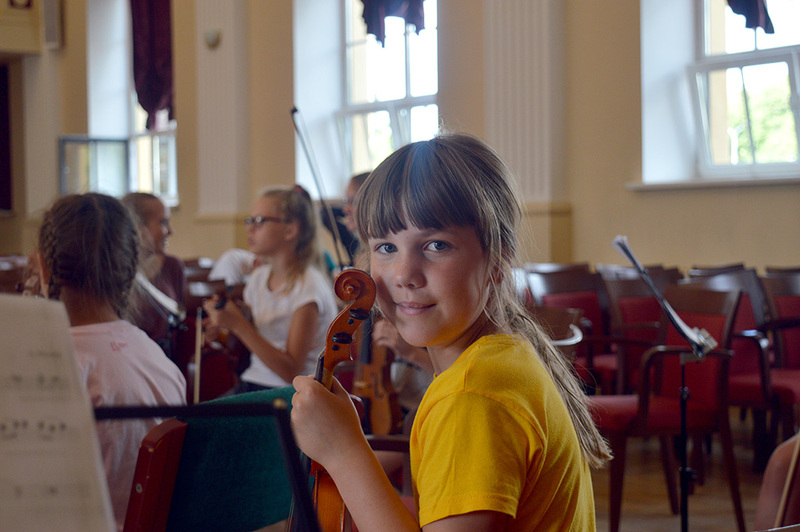 “This camp is very exciting and there are many interesting things here and it is possible to develop your playing skills,” said Hanna-Marie Laul, from the 3rd violin section, who participated for the first time this year. 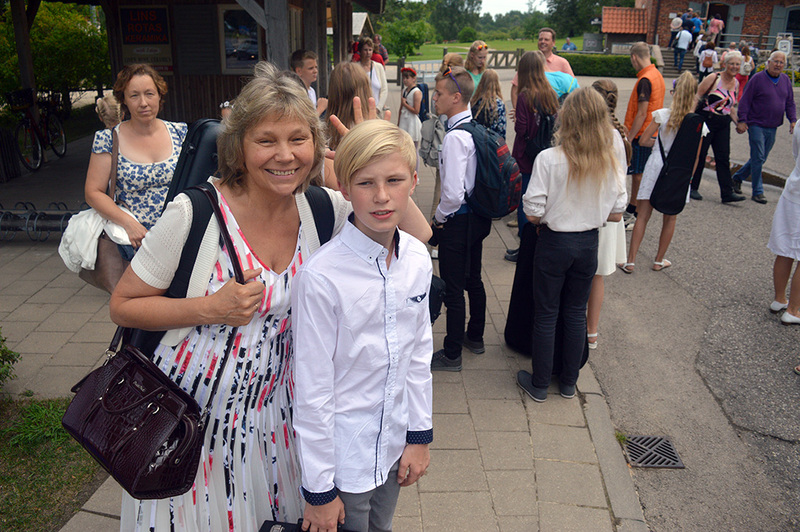 In addition, the camp was regarded as a place, where it is possible to prepare for music schools before the fall and to remind oneself what it was like to perform on the stage. Several concerts brought variety to the camp life. 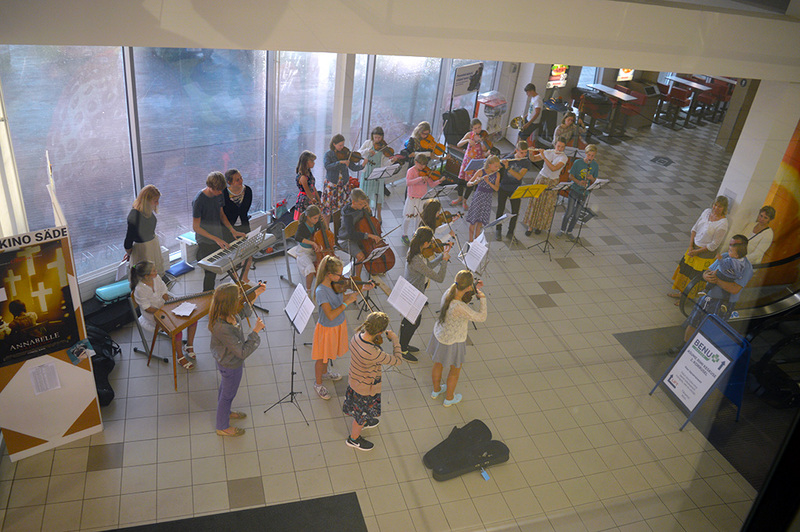 On Wednesday evening, the orchestra visited Seda retirement home. 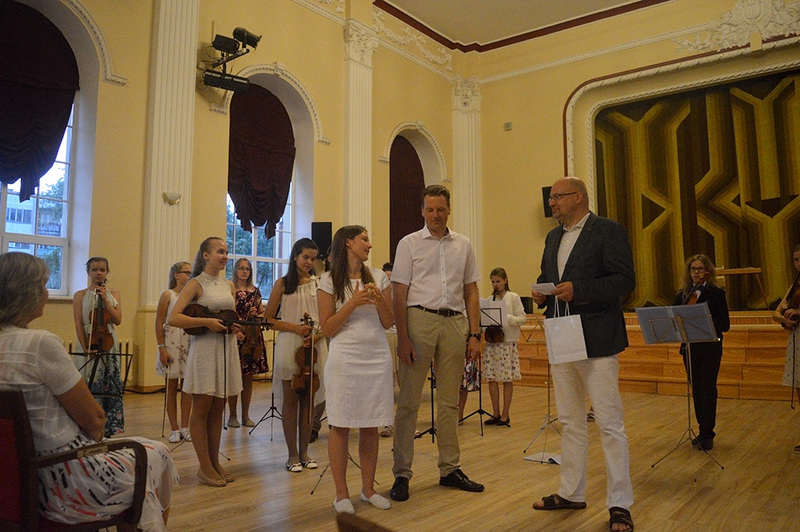 The orchestra planned to give an outdoor concert in Valka on Thursday, but rain interfered and finally, the orchestra drove over the Estonian border to perform in Valga’s Rimi shop. “The concert in Rimi was surprisingly fun,” said Hans, “I think that it was even more fun than it would have been in the open air. 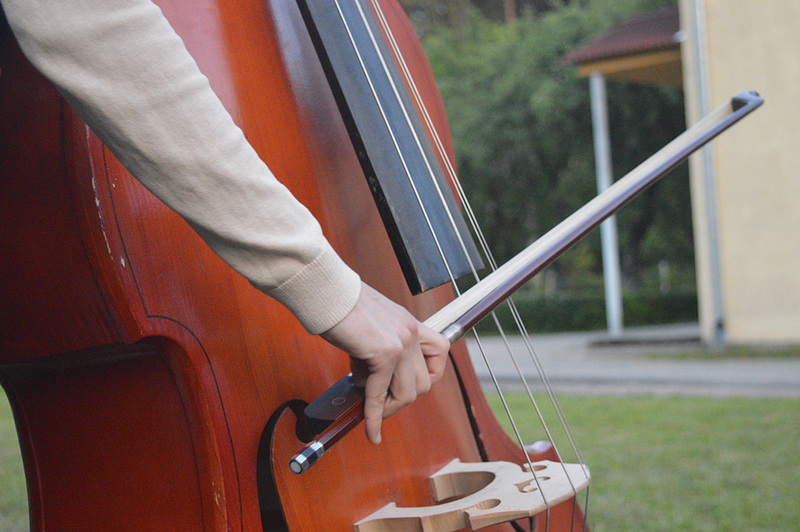 The sound was very good and I don’t know how many people would have visited the outdoor concert, but there, people were passing all the time.” Listeners, who liked the music, gave the players lots of sweets. On Friday, the participants were able to be like superstars because everyone drove together to Turaida castle to film a music video. 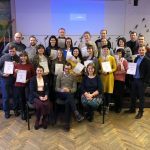 A fun day was made even better by a trip to the Sigulda adventure park, where children and youth were able to try out slides, test their skills on a climbing wall, jump on a trampoline, or shoot arrows. The more adventurous ones also tried out the roller coaster. 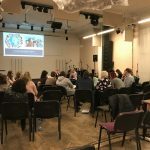 The camp ended on Saturday evening with a festive concert in Valka Cultural Centre, where about a hundred listeners were gathered. In addition to often-played and well–known songs, the orchestra played a recently learned song during the concert — a part of the second movement of A. Dvořák’s New World Symphony, arranged by Rein Kalmus. Written by Ly Kaasik, translated into English by Susanna Soosaar. 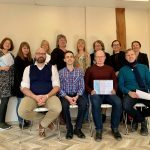 This entry was posted in BAUC, Children, Culture & Society, Estonia, Latvia, Lithuania, News. Bookmark the permalink.